It often seems that amazement is in short supply. If you’re plugged into the web, exposed to consumerism and bombarded by media it’s all too easy to take things for for granted. Technological advance is an area where this is particularly apparent, possibly because the pace of change is so fast - what was new yesterday is passé today. 2002 doesn’t sound that long ago, but it’s way back in the dark ages in amazement terms, a year before Facebook, four before YouTube and still five years had to pass before the iPhone arrived. Non of these things now seem amaze and the surround sound widescreen DVD that occupied me for part of that year is a long way further down the list. 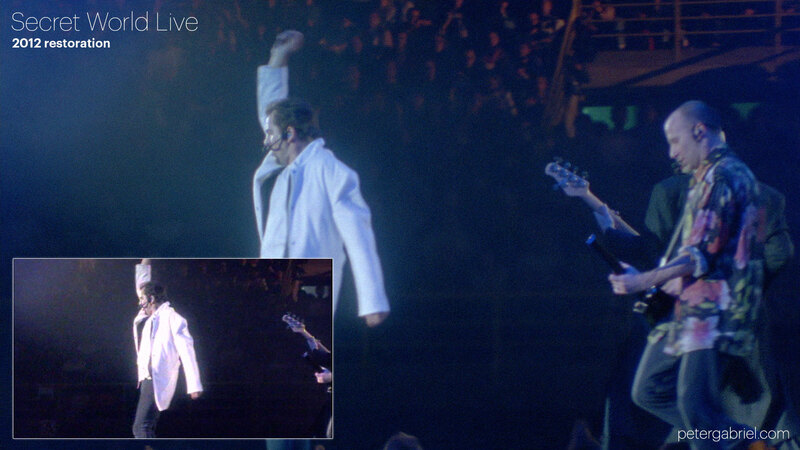 My first encounter with Peter Gabriel’s‘s 1994 film Secret World Live was probably with some of its stage props, a telephone box that features in the opening track ‘Come Talk To Me’, along with the tree that featured in ‘Shaking The Tree’, still occupy a prominent position in Peter’s storage facility at the studios in Box. The tour was over by the time I arrived at Real World, but some years later, in 2002, the film took Stefan Goodchild, Lee Parry and myself - then the Real World Multimedia team, on a major learning curve as we designed and developed the DVD version. We threw ourselves into creating the best DVD we possibly could. Pete Walsh returned to the studios tho mix the new 5.1 surround audio and we all worked night and day to make something as good as we possibly could. It seems hard to believe now, but along with Richard Chappell (Peter Gabriel’s audio Engineer), we threw ourselves into the project and saw many dawns arrive as we tweaked the code, rendered the assets and watched the film frame by frame for compression artefacts and sync issues. In retrospect it’s possible to look at the DVD and question some of the decisions. We went to the best picture source available - digibeta tape, and we reframed the film for 16:9 widescreen televisions, but there was something fundamentally odd about chopping the top and bottom from and image to make it fit the new aspect of screens, although it was considered a commercial imperative in the vibrant home cinema market. We did the job very carefully, so the framing is better than it would have been if we had left peoples TVs to zoom the action, but fundamentally you’re taking information away and then blowing up the result. There are no absolutes in preparing content for a DVD, each frame is a balance between the complexity and colour of the image, the audio tracks - 3 in this instance, and the absolute space on the disc - inevitably each frame is a compromise. The audio on the other hand was remastered from the original analogue source, so whether in 5.1or stereo, it was a genuine step up from previous versions. Ten years later with the arrival of HD, new delivery formats and a relationship with Eagle Rock; formed around Peter’s recent New Blood film, the oportunity arose to look once again at Secret World Live. I’d become the custodian of Peter’s visual archive at Real World and was aware that at leat some of the original film was in ‘Container 1’. I contacted as many of the original production team as I could in an attempt to find an EDL (edit decision list) for the project, but beyond the pile of cans in the store nothing was to be found - 1993 seemed like a long time ago. I sent a few of the reels away to be scanned so that we could get an idea of the quality of the film - had it survived nearly 20 years in storage? The results were so exciting that we began to formulate a plan to rebuild the film from the ground up. JCA performed a quick Standard Definition scan of all the material and then they painstakingly matched the film shot for shot with the original edit. There were just a few shots we couldn’t find, but with all rushes available we were able to source alternative shots and build an edit for the whole film. The relevant sections were than scanned on JCA’s amazing Arri scanner at Super 2K - the machine locks the sprockets for each frame then scans it to a file 2000 pixels across. It’s generally accepted that this machine pulls the most information possible from 16mm film, so our digital files are now match the quality of the original source. With the edit now built from the best scans available I worked with Colourist Ray King and Supervising Restoration Artist Anthony Badger to bring the film to life. They added polish to the files, removing any dirt and scratches and balancing the colour and exposure across all the cameras. During the scanning process we had discovered that many of the cameras wre shooting a wide Super 16 image, but with the original edit targeting the 4:3 televisions of the 90’s much of the drama these wide shots provide had been cropped from the frame. Now we could take adavntage of the film format, so that much more of the action is visible - as in the image featured here, we were able to pull people back into shot where previously they had been outside the frame. Whether or not you will now be amazed at the results is open to question, but it’s certainly true that the film has never looked this good. Having an original analoge source has ment we can go back and find things in the image that just weren’t visible before. It’s odd to think that it’s only been possible to achive this true High Definition result because the material was shot on film - all those years of video prodction are stuck at their native resolotion, or have to be blown up in software. The image I’ve included here shows 1:1 the size of the PAL DVD image agianst the new HD version - it’s amazing. The end result will be released by Eagle Rock on July 16th and is available to order now.